The Ashuwillticook Rail Trail is a former railroad corridor converted into a 10-foot-wide (3.0 m) paved, universally accessible, scenic rail trail path. The Ashuwillticook (ash-oo-will-ti-cook) Rail Trail runs parallel to Route 8 through the towns of Cheshire, Lanesborough and Adams, Massachusetts and is used for biking, walking, roller-blading, and jogging. The trail is managed by the Massachusetts Department of Conservation and Recreation (DCR). Its first two phases opened in 2001 and 2004, with a 1.2-mile northerly extension opening in May 2017. The southern end of the trail begins at the entrance to the Berkshire Mall, off of Route 8 in Lanesborough, and travels 12.2 miles (19.6 km) north to the center of Adams. Built during the industrial boom of the 1800s, the railway proved to be a vital commercial link from the Atlantic Seaboard to communities which would have otherwise been isolated in the Berkshire Hills. In 1845, the Pittsfield and North Adams Railroad developed this corridor with the goal of extending the Housatonic Railroad north to Rutland, Vermont. While the track was under construction, the company was acquired by the Western Railroad, which later became part of the Boston and Albany Railroad (B&A), as their North Adams Branch. Mineral traffic developed on the line and a number of limestone operations went into business. The New York Central Railroad took over the B&A in 1900, and upgraded the line, which was sold to the Boston and Maine Corporation in 1981. As a connection to an existing track in North Adams, Boston and Maine ran the line with declining success until they abandoned rail service in 1990. ^ a b c "Ashuwillticook Rail Trail". Department of Conservation and Recreation. Archived from the original on March 28, 2014. Retrieved August 2, 2007. ^ "Ashuwillticook Rail Trail Section Open, Trail Now 12.2 Miles" (Press release). 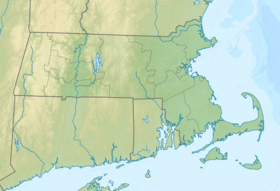 Massachusette Department of Transportation. May 23, 2017. Retrieved November 21, 2018. ^ Guerino, Jack. "Adams Celebrates Rail Trail Extension Opening". iberkshires.com. Boxcar Media LLC. Retrieved June 30, 2017. Wikimedia Commons has media related to Ashuwillticook Rail Trail.